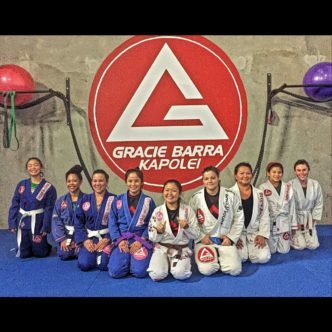 There is no greater joy than that of bringing a new life into this world, but for women that train Jiu-Jitsu they face a tough decision. Do they to keep training or take a break when they become pregnant? It is a hard decision for many as we know how much Jiu-Jitsu means to us, but is Jiu-Jitsu safe for an unborn child? How does a mother to be decide? 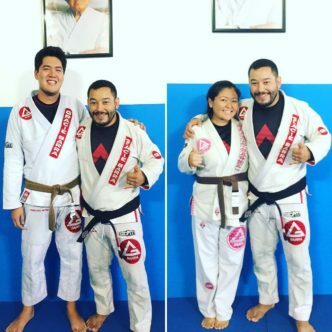 Heather Tabios, a brown belt of Gracie Barra Kapolei under Professor Elias Ramirez, was recently faced with this decision. Heather began her Brazilian Jiu-Jitsu journey on May 1, 2009. She says that she was “volun-told” to try a class with her husband (then boyfriend) by friends who taught the class. She says she had no prior experience in any type of martial arts or fitness. However before she began training Jiu-Jitsu her, her husband and her husband’s family was heavily involved in the drag racing scene at Hawaii Raceway Park. She says after the Raceway Park was shut down in 2006, her and her husband were looking for another activity that both could enjoy together and that offered a community with a sense of family. 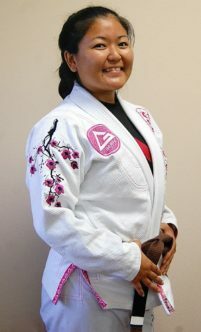 She says her interest was peaked right from the start as Jiu-Jitsu aligned with her goals of staying physically fit, learning self-defense, being mentally challenging and doing an extracurricular activity with her spouse. Not to mention she found a new family on the mats. According to Heather to be a Jiu-Jitsu practitioner, especially a female, takes a lot of dedication and willingness to learn. She says that you may not be the best, you may not get the movements right the start, or you might get submitted a billion times. However, it is the person who keeps coming to train and learn that will grow. Heather also feels that the training environment is just as conducive to the individuals growth. She says that if you do not feel comfortable or you feel shameful at the school you are at, it just may be the wrong school for you. There is no reason to stay when there are so many schools out there that are supportive of females training. You should never feel like the whole world is against you. According to the women Heather has talked to the most hindering aspect of Jiu-Jitsu is the physical contact. She says that for those who have never had an interest in martial arts it is important to for them to feel comfortable while doing close contact movements. Heather recommends women’s only classes or pairing women up with other female partners to help them overcome these challenges and make them feel more comfortable. She says by doing this eventually it will become less about who their training partners are and more about executing the movements. Heather strongly encourages Jiu-Jitsu for women as it is a great way to stay physically active, learn self-defense and is a great activity for the whole family. Heather believes finding a school and instructors that makes you feel comfortable is key. It is also important to remember you have options if the school you find isn’t a good fit. Jiu-Jitsu may not be for everyone, but as long as you give it a try that is what matters. Recently Heather is embarking on a new phase of her Jiu-Jitsu journey. She and her husband are expecting their first child this April. Heather has been actively training during her pregnancy and continued teaching the women’s class until she was around 4 months pregnant. She says she was still able to demonstrate some throws and take downs but she could slowly feel her body not responding or moving the way it used to. Much like Jiu-Jitsu Heather has had to adapt and evolve. 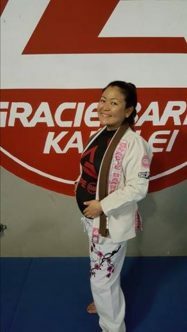 She says her game has always been playing half guard but with this pregnancy she has been forced to practice open guard attacks and transitions. With the clearance from her doctor she intends to training as long as she can. Now six and half months pregnant Heather is no longer teaching. However she is still on the mats taking the advanced classes. She says that she has great support from training partners who are familiar with her limitations and have been more than supportive and understanding. Although her body has changed she says that most of the time she is still able to set up the techniques or throws and executes them safely. It also helps that her professor is great at showing a variation of the technique to accommodate her growing belly and restricted movements. She is no longer able to spar, but has been flow rolling. No two pregnancies are the same just as no two mothers to be are the same. Heather feels that it is important for women who are pregnant who want to continue training, to ask their physician or OB first. She says that when she first found out she asked her OB a million questions to make sure that she was in no way harming the baby. Her doctor has encouraged her continue training since her body was used to the movements from repetition over the years. Her doctor urged Heather to use her best judgement when it came to certain moves and the safety of the baby. According to Heather it is very important to let your partners and professors know of your condition. She says the first trimester was the hardest, but she realized she had to let her professor know especially since she was teaching. Heather also has to use her best judgement when it comes to selecting training partners. She says if you know you are put with a partner that may not be safe, you have the right to excuse yourself. If that continues to become an issue or is looked down upon, it may be time to look for another school that is supportive. It is better to be safe than sorry.